This is one of my favorite places to paint plein air at Bass Lake in Blowing Rock, NC. The view is spectacular and there’s plenty of shade. In fact, Bass Lake has so many wonderful places to paint that I never run out of options. You’ll run into lots of other painters there — as well as runners, walkers, hikers, fishermen, horseback riders, and lots of other lovely people. I am so grateful to have the opportunity to have a show this summer with my paintings from the Blowing Rock area. “Blue Ridge Impressions: Brush and Knife” will open July 17th and run through July 27th at Blowing Rock Frameworks and Gallery. The reception is July 22nd from 5-8 pm. 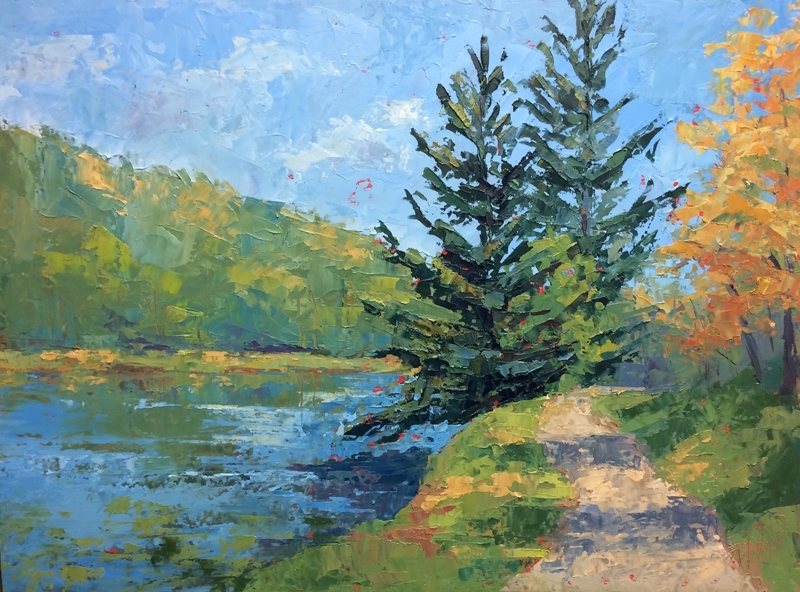 The show will include lots of views of Grandfather Mountain, Cone Manor area, Bass Lake, Trout Lake, Price Lake and other landscapes from the area. I’ve had such a great time exploring some new areas to paint while preparing for this show. The views from Grandfather are so spectacular. I even painted on top looking at the Mile High bridge. I had to paint with one hand on my easel the whole time because of the wind! Thank you to Tim and Alex at the Gallery for being so supportive! I so appreciate the opportunity! And I am so grateful for my patient husband, Michael, who’s been my cheerleader all along and picked up the slack while I was frantically trying to get paintings done for the show!!! Hope you can join us on the 22nd!!! This entry was posted in Art Show, Palette Knife Painting, Plein Air and tagged Bass Lake NC, Blowing Rock Frameworks and Gallery, Blowing Rock NC, Blue Ridge, Blue Ridge Mountains, Boone NC, Grandfather Mountain, landscape, painting from life, Painting red maple, palette knife painting, plein aire, plein aire painting, Price Lake, Solo Show, Valle Crucis on July 11, 2017 by Robin Wellner.